Book2Park.com gives you great deals on airport or seaport parking. Check your reservations is quick and easy. View upcoming reservations and scheduled shuttle runs. View pickup list from airport and scheduled shuttle runs. Identify theft and misappropriation by verifying car counts and plate numbers after employee shifts. View space counts in real-time. View revenue. Search or export financial report. Monitor your lots and make informed decisions from anywhere using your dashboard. Welcome Book2park.com Partner to your customized Administration Page. Book2Park.com is your best choice for airport/seaport parking! Thank you for being a partner we value your business! Earn money without added inconvenience. 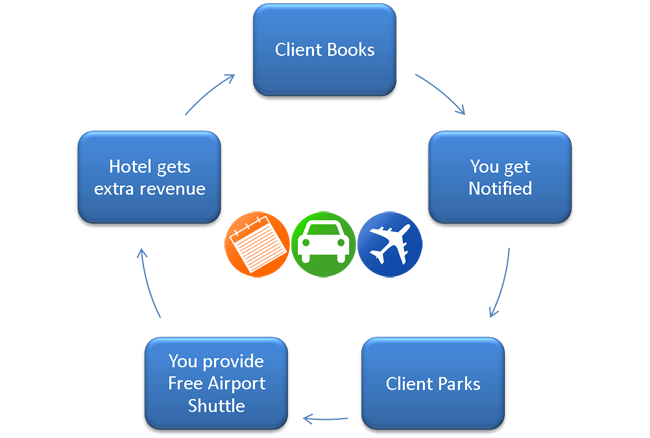 Generate extra revenue, no added expenses. Over 175 partners in 52 cities in the US and Canada.